Baby, it's cold outside. Actually, it's pretty darn chilly inside too. But before you go cranking up the house's thermostat and heating a bunch of empty rooms, take a look at some toe-toasting space heater alternatives. Unless your going old-school and building a proper fireplace fire with proper firewood, you've got three primary technologies at your disposal for indoor heating: Electric, Oil, and Infrared. The type you chose depends largely on how much space you actually need heated. Fast-heating electric sets, for example, are best for smaller rooms with fewer people, while larger oil-filled or IR units take a while to get going but will keep a larger room toasty for hours. Kerosene and propane-powered sets on the other hand are right out—unless you enjoy dying of carbon monoxide poisoning—and should only be employed on sheltered patios, or other areas with plenty of ventilation. The general rule of thumb for picking the right sized heater for the room in question is roughly 10-15 watts per square foot—a 100 square foot room needs a 1,000 watt heater. 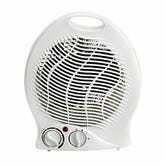 Also there are a few basic safety features you should look for in any space heater, like a knock-over sensor, an overheat sensor, or better yet, both; space heaters tend to overheat when pushed over and that's what starts fires. If you have a smaller area like an office, bathroom or den to keep warm, the is your best option. Despite its small size, it raised the temperature of our testing area over the course of an hour by more than any other heater we tested. It also scored points for ease of use, cost of running and safety. And it's only $25. It's easy to see why it's one of the most popular models on Amazon. On the higher 1,500 watt setting (which is the most you can pull out of a single wall outlet), the Lasko 754200 raised the temperature of our test area by 14.7 degrees Celsius (26.46 degrees Fahrenheit) in one hour's time. This is astounding given that the second place SoleusAir HGW-308R could only raise it by 10.9 degrees Celsius (19.62 degrees Fahrenheit). There's also a 900-watt low setting that's good for maintaining temperatures or even smaller areas. Oil-filled radiant heaters, take far longer to get going than their electric counterparts but sometimes slower is better. For one thing, the surfaces of oil heaters don't get nearly as searingly hot as electrics so there's less risk of setting clothes, rugs, and blankets alight if they accidentally come into contact. What's more, the oil contained within a radiant heater holds onto the warmth it produces for far longer than the spindly heating filaments of electrics. And oil heaters generally don't require a noisy fan to move hot air throughout the room. Finally, since you don't have to keep running it to keep warm, a radiant heater is a bit easier on your utility bill as well. The $86 DeLonghi EW7507EB is a solid choice for a radiant heater. It's portable, which means you can use it for heating the whole living room during the evening and move it into the bedroom to keep you warm for the rest of the night. Plus it less than 30 pounds to keep it from tipping over or getting mired in the plush of your carpet.